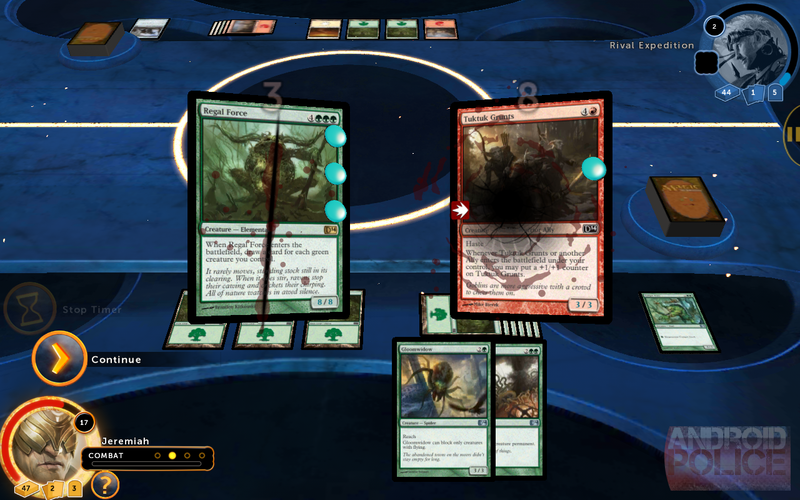 Magic 2014 is the new and updated version of the less headline-friendly Magic: The Gathering: Duels Of The Planeswalkers, gracing Android for the first time. It's a digital translation of the uber-popular Magic: The Gathering card game, a staple of schoolyards and table gaming for the last two decades. Magic 2014 is a free download (though it needs a massive 1.2GB of space), but requires a $10 in-app purchase to unlock the full game. The free demo features the first 25% or so of the campaign mode. 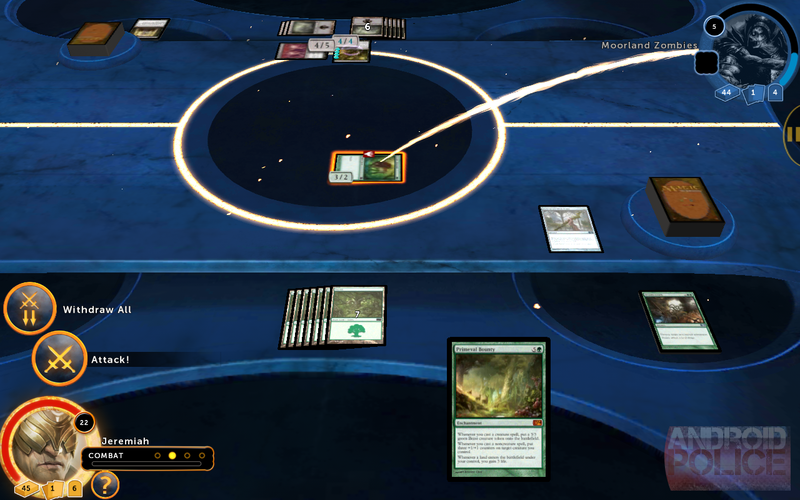 There are a lot of things wrong with the digital version of Magic: a clunky interface, boring visual effects, downright awful optimization of both space and active system resources. But despite all that, it managed to teach me the basics of the game and engage me in the incredibly varied strategies and play styles of the widespread cards. If you've got a newer, more powerful tablet, you've got nothing to lose by giving Magic 2014 a try. Fans of the trading card game will enjoy having access to a test bed for strategy and deck building, as well as local card battles. An unfortunate pay-to-win scenario may exist thanks to IAP... but then, that goes for the real version of the game as well. 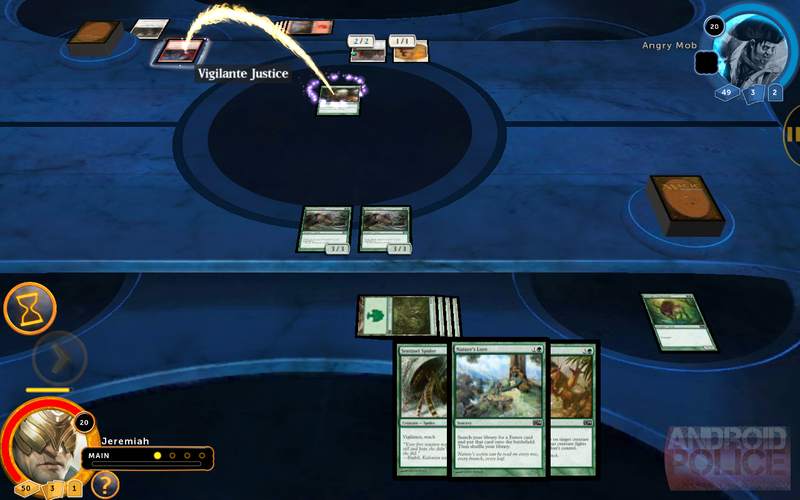 Overall, Magic 2014 is a much better game than its poor technical merits suggest, at least if you're the type of gamer who can enjoy a turn-based strategy title that's low on pizazz and high on variation. Just watch out for some wicked hardware requirements and in-app purchases. I'd never done anything but watch Magic: The Gathering before trying out this game. If you've played before, you won't need much beyond a refresher course for the game rules, but newbies like me get a full tutorial. Here's the gist of Magic: two players duel each other on an elaborately structured (and mostly imaginary) battlefield. Broadly speaking, each player can use three different types of cards: land cards, creatures, and modifiers. Land cards provide manna in five different flavors, which allow you to place creatures or apply modifiers. Most of the "fighting" is done by the creatures, which can directly attack an opposing player's health, or defend your own. That sounds simple. It is not. The staggering amount of cards and rules that are applied to each battle will make your head spin, and that's coming from someone who knows his way around both tabletop and collectible card games. Some "real" Magic players spend years building up deck collections and strategies. 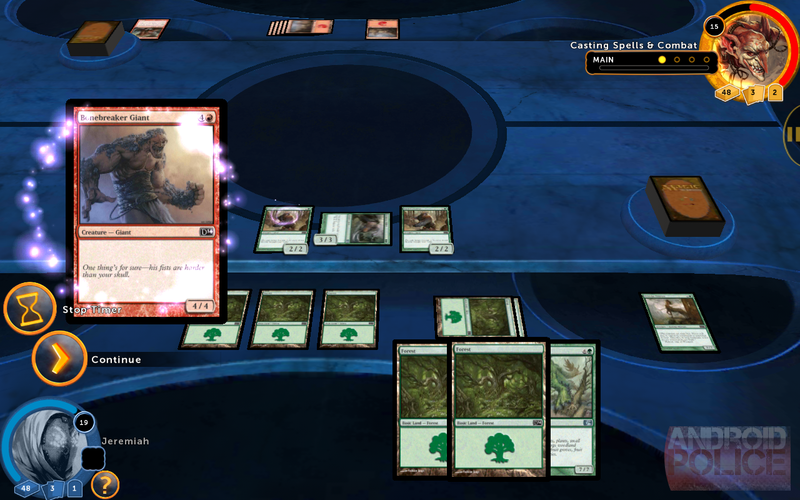 It's a good thing, then, that Magic 2014 slowly eases you into the game, doing some much-needed hand-holding while it explains the basic structures and recommended moves. 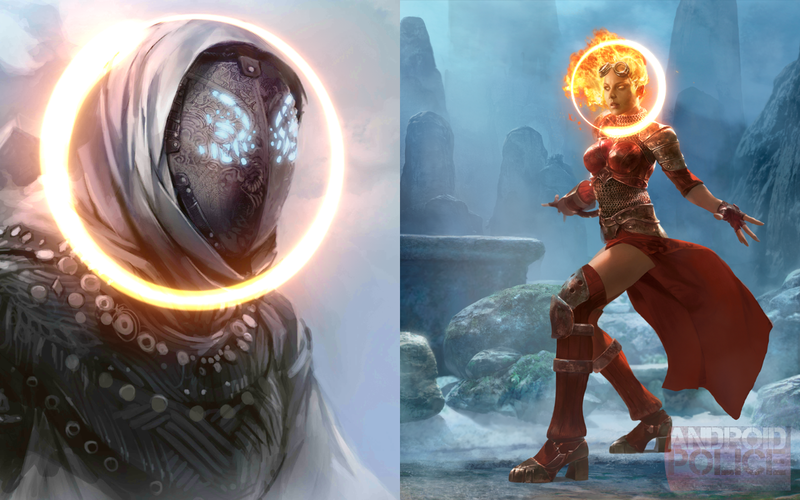 The best part about Magic, at least after playing it for only a few days, is the infinite variety. There's no such thing as an unbeatable deck or a perfect strategy - there's a way to defeat every opponent, even without resorting to super-powered monsters with high manna requirements. Again, this is an element of the trading card game, not the digital game itself, but it makes for some satisfying strategy play nonetheless. The relatively slow pace is great for the touch interface, even if the animations and wait times are occasionally tedious. The tutorial campaign isn't perfect. It took me quite a while to understand the flow of battle and the reasoning behind the complex systems of moves, blocks, manna, and counters. 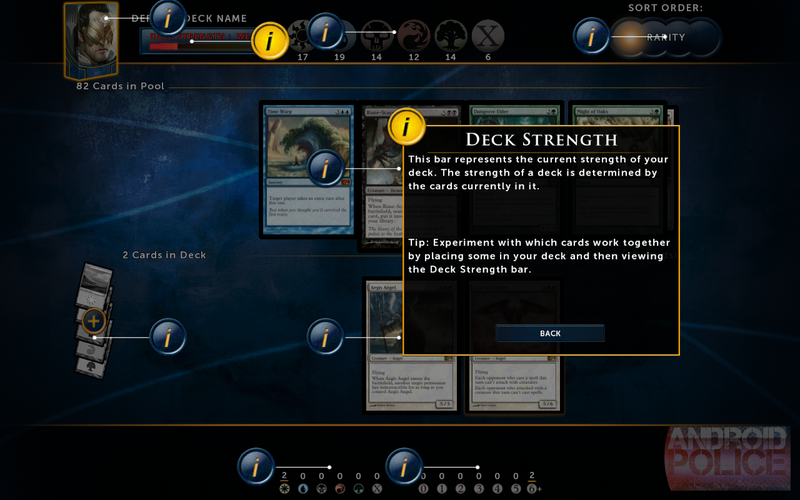 But most of the problems stem from the interface (see below) and the obtuse structure of the card game itself, and I can't really blame the developers for the latter. Once you find your feet, you'll start progressing though the story, which may as well not be there. You're a mage who's teamed up with Chandra (the literally fiery redhead who's absolutely plastered all over the game's marketing and menus) for a mix of treasure-hunting and revenge. A few pre-rendered cutscenes and some okay voice acting flesh things out a bit, but this is no Skyrim. 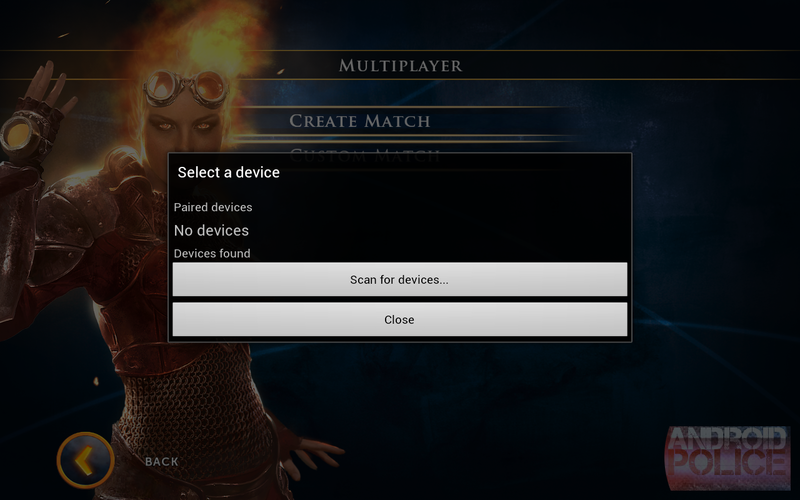 Multiplayer is included in the game, but unlike the PC, console, and iPad versions of Magic, it's local only (Bluetooth ad-hoc). 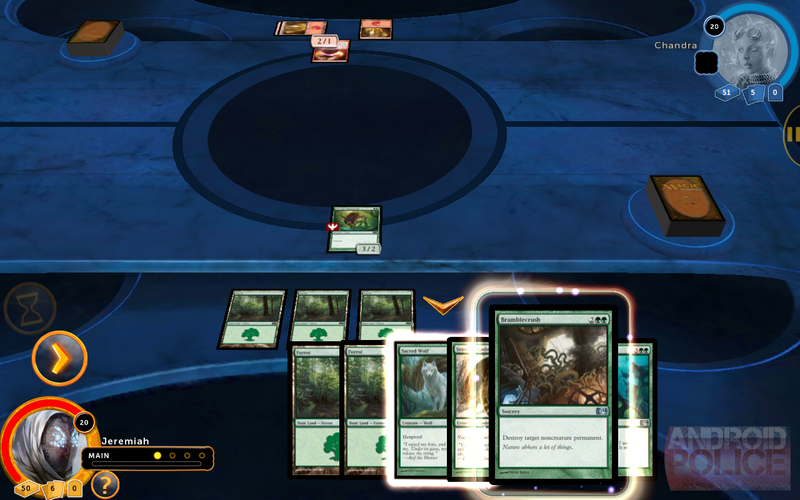 The Android version of Magic 2014 is the only one without online multiplayer, making it objectively the worst way to play the game. It also means that I had no way to evaluate the the multiplayer component for this review. Dear Stainless Games: that's some bull right there. I've contacted the developers to ask if they plan to add an online play feature - I haven't been able to determine whether it's currently in the cards, if you'll pardon the pun. 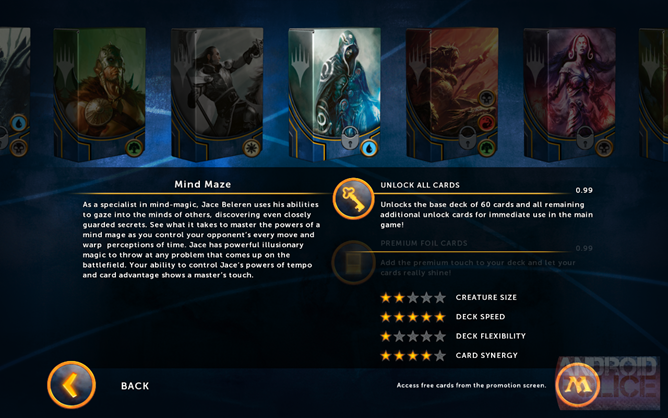 The lengthy campaign mode will open up a handful of themed, pre-built decks, and some (but not all) of the cards within gradually become available for the deck builder feature as you progress. 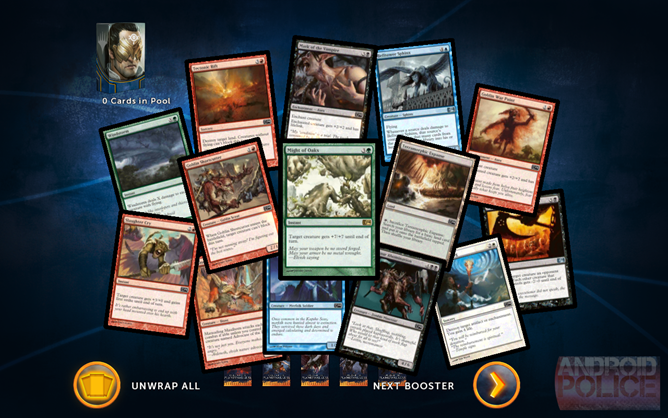 If you want to dive into the subtle art of deck building, you'll have to open the Sealed Play mode, where a handful of digital "booster packs" are combined for a second campaign. 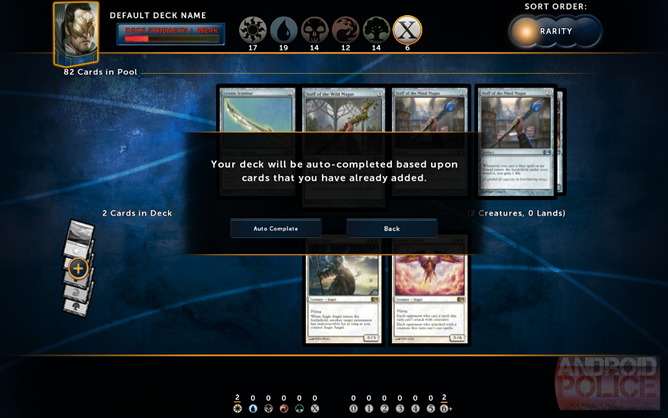 Decks can be created and modified in the Deck Manager. You'll start with a leafy green deck, but simply owning a deck doesn't give you access to all the cards within for the Deck Manager: you'll have to slowly, laboriously unlock them one by one in single-player battles or (sigh) pay a buck to get access to the whole shebang. You can also convert the deck into a more powerful shinier Foil version for a buck. These add-ons aren't all that unreasonable... unless you count the fact that gaining access to the full game (all the campaigns and local multiplayer) costs $10, putting Magic 2014 decidedly into the premium category on Android. 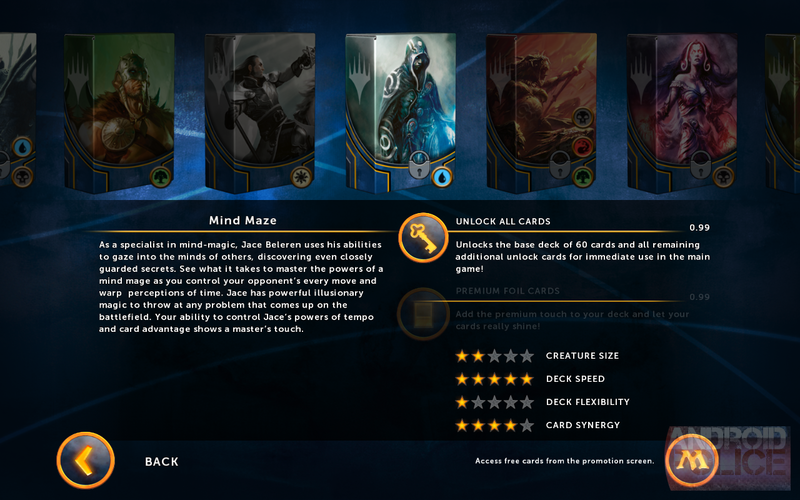 Pricing complaints aside, the deck builder is incredibly robust. 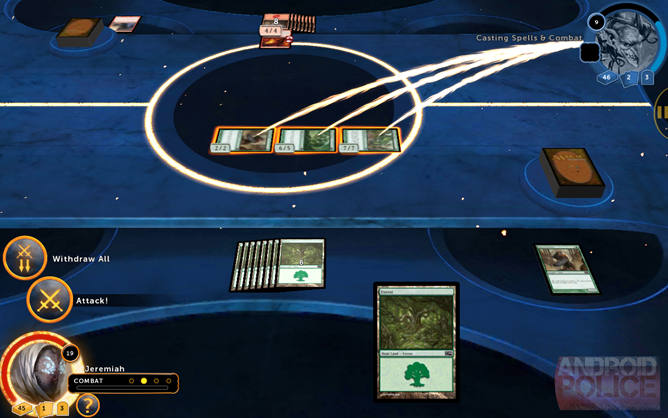 Players can sort cards and decks by manna type, rarity, card type, and creature class, picking and choosing cards with a full dynamic readout of the current build. Of course, building a deck that actually works is beyond newbies like me, so players can throw all their cards into one digital pile and let the computer build the most powerful deck out of them. One of the best features I saw in the game was the ability to select individual cards from your deck or booster collection, then have the AI automatically build a deck around them. Let's say you really like your giant plant monsters, but want to thrown in a phoenix with a Magma Axe chaser. The A.I. 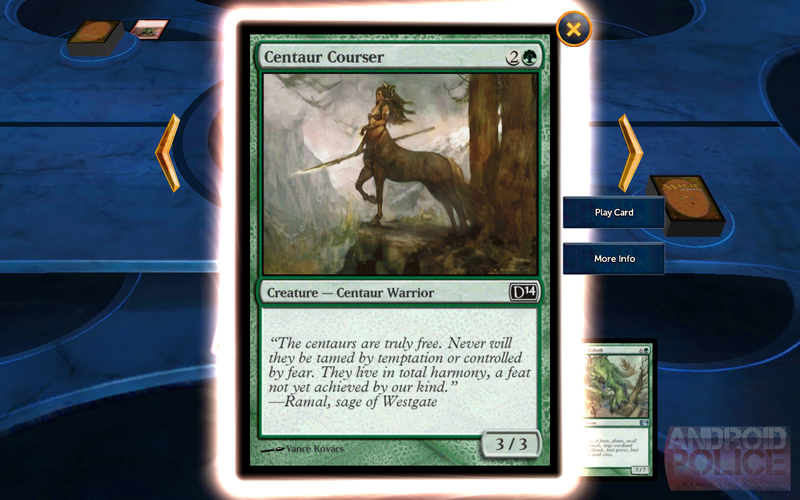 will build a deck catered to your tastes, assuming it can balance the need for creatures, land, and magic among your unlocked/unwrapped cards. The Deck Manager is Magic's biggest strength for experienced card game players. New players won't find a lot of use in it, but as their skills progress and they want to customize their battling experience, it becomes a more satisfying alternative to pre-built decks. With an install size of more than a gigabyte, I was expecting a to see digital monsters pop up out of the cards and start fighting each other. 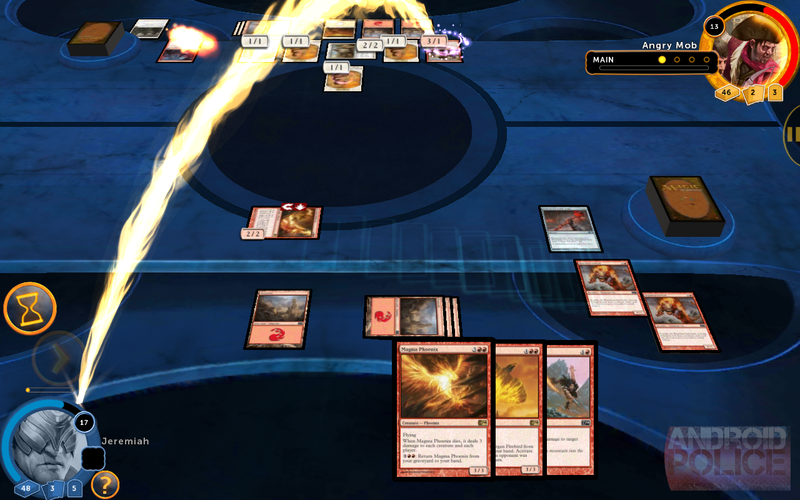 Technically, Magic is a 3D game - high-resolution versions of the cards from the real 2014 edition of Magic: The Gathering are textured onto moving cards on a 3D gaming board. There are a few hocus-pocus battle effects, and a handful of powerful cards do some very short animation, but overall it's a pretty static experience. On the other hand, the artwork within is up to Magic's usual high standards of fantasy and horror, and comes with this nice bonus: you won't have to squint to see the sweet hand-drawn and painted designs. Hi-res cards aside, I think the whole game could have been done just as well with only sprite graphics. And I wish that the game was 2D - maybe then it wouldn't absolutely kill my Nexus 7, in terms of RAM, processor, and battery life. This is easily the biggest, heaviest game I've ever seen, besting 3D spectacle-fests from Gameloft and Madfinger in terms of hardware-straining bloat. 1GB of RAM is not enough to run Magic 2014 effectively. I had to switch over to my Galaxy Note 8.0 (which isn't even officially supported at the time of writing) to get the game in a playable form. And there's nothing in there, with the possible exception of some hi-res textures, to justify it. I understand the desire to make it look like the console and PC versions. And it does; see the trailer at the start of this post for proof. But the optimization is so poor that many prospective players simply won't be able to run it. 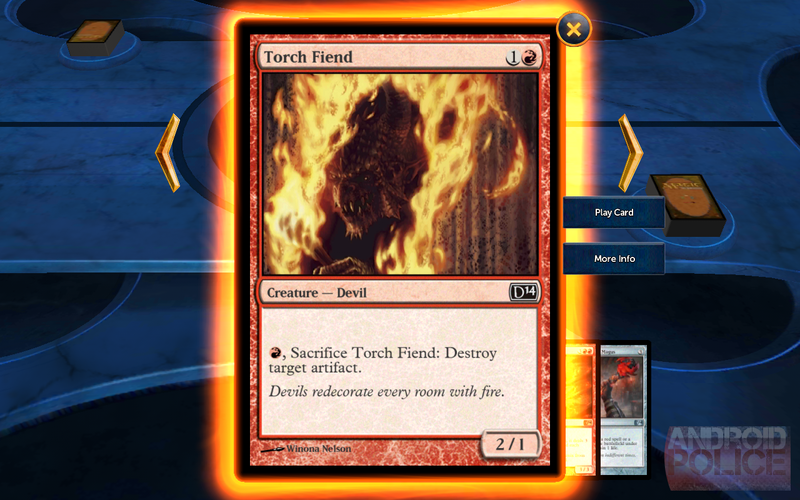 I would burn through about 25% of my tablet battery power per hour playing Magic 2014, which is faster than any app or activity I've ever seen. I sincerely hope that updates are coming to make the game faster, more stable, and easier on system resources. 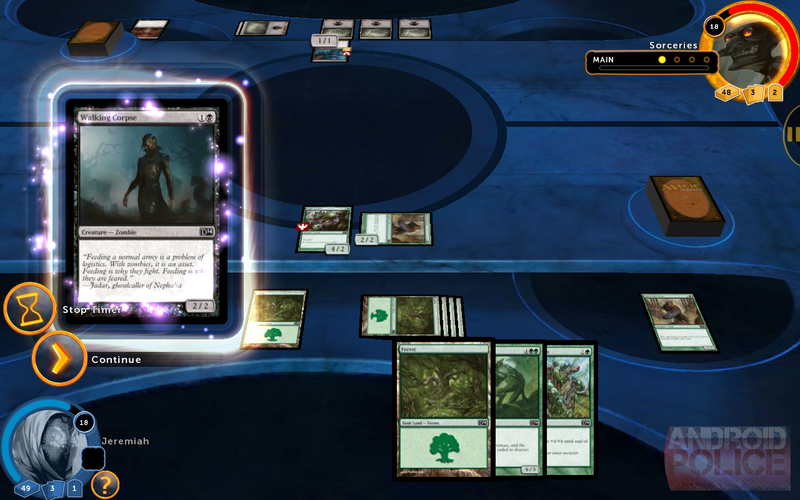 Speaking of tablets: use one to play Magic 2014. While it's compatible with at least some phones, the interface is clearly geared toward larger screens. Even on the Nexus 7, some of the buttons and fonts were uncomfortably small, clearly designed for latter iPads. The game interface itself could also use a lot of work: it's not always clear which action is assigned to a particular button, especially when you're starting out. It took me several matches to learn the precise combination of taps to perform an effective block, even after re-doing the tutorial, and I had to restart several battles due to an errant touch. 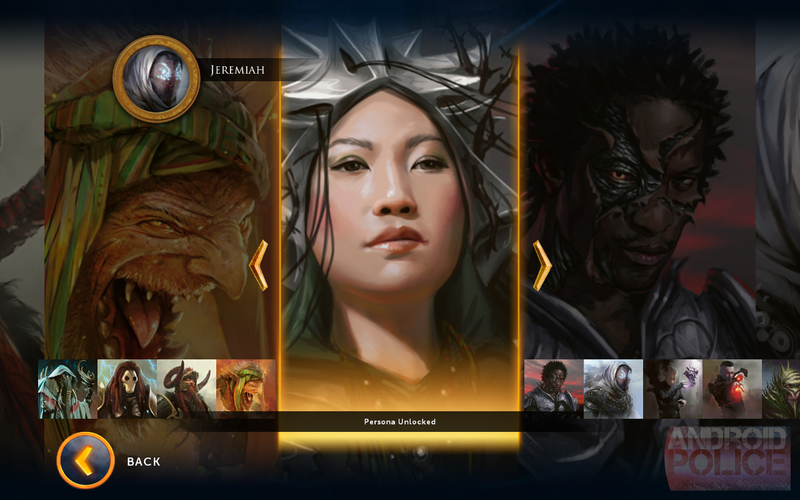 The free download of Magic 2014 includes two of the five story campaigns, plus access to part of the Sealed Play mode and basic deck building. A $10 in-app purchase (the same price as the base game on consoles and PCs) opens up the full single-player experience, and grants access to multiplayer and a few extra goodies like a video player and artwork browser. Now, I don't think ten bucks is too much to ask for a AAA game, especially when it's comparable to versions on other platforms (online multiplayer notwithstanding). But that's not all. Then comes the upsell. You can pay a buck to unlock full decks in the deck builder, instead of grinding hours in single player. You can pay to upgrade them to foil editions. You'll have to pay two bucks for each additional deck slot. And that's before the inevitable upgraded content that's coming in later months. This is pretty egregious by mobile standards - ten bucks plus IAP makes Magic one of the most expensive games in the Play Store. That being said, the IAP is also in line with the full-sized versions (although console and PC gamers know it as "downloadable content"). And considering that you can play with the entire 2014 Magic card set, assuming that you either unlock or buy everything, it's not that bad - the real-world cards would cost twenty bucks for the basic set, then $5 a pop for booster packs to hunt down rare cards. When you think about it, collectible card games are the original IAP/DLC model... complete with the pay-to-win caveat. 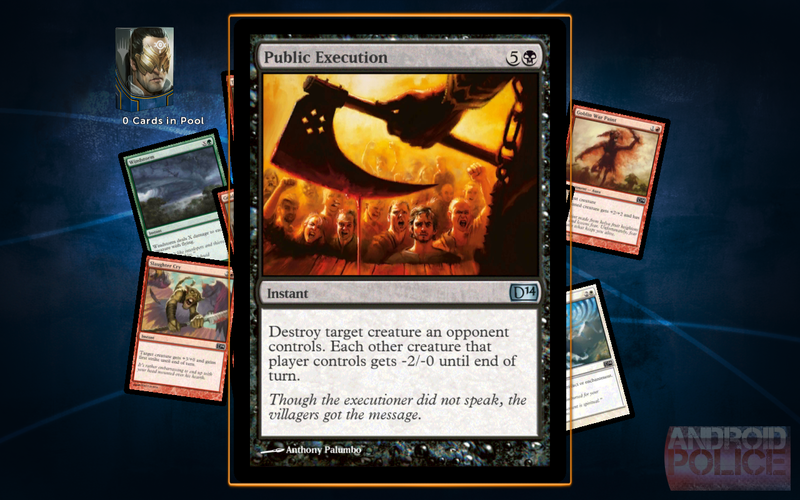 There's a lot wrong with Magic 2014. It's expensive once you get past the demo stages, it's pretty lackluster from a technical standpoint, the controls are a long way from intuitive, and the game is downright awful when it comes to hardware optimization and interface. It's clear that the developer needs to put a lot more work into the Android version relative to other platforms, starting with an online multiplayer mode... the absence of which borders on insulting. That said, the core card game is excellent, especially for players who crave deep and complex strategy. It goes without saying that regular Magic fans will be satisfied, though the constraints of the digital platform and a lack of back-catalog cards mean it's no substitute for the real thing. If you've been craving some challenging turn-based gameplay (and you've got powerful hardware with space to spare) you might as well try out the free version. Once you've made it through the tutorial and few campaign enemies, you'll know whether or not the game is worth your time and money. I'd still hold off on paying the full price until the developers add online multiplayer. 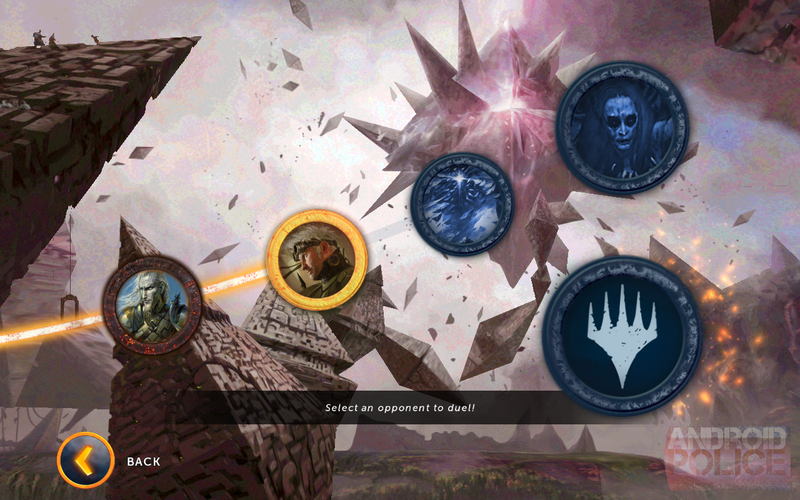 ...we appreciate your inquiry about multiplayer game play on Android for Magic 2014 – Duels of the Planeswalkers. Since our first announcement of the game at PAX East this year, we have remained upfront with press and consumers regarding this industry-wide challenge. While the Android tablet version of the game released with Ad-hoc multiplayer, we are continuing to examine an online multiplayer solution for a future update. We don’t have anything additional to announce at this time. Again, we appreciate the inquiry and opportunity to comment.